CARLSBAD, CA--(Marketwired - Jan 6, 2015) - Mamma Chia, creator of the first-to-market chia beverage and celebrated chia innovator, is taking breakfast and mindful snacking to new heights with the introduction of their soul-satisfying Chia Vitality Granola Clusters. Each crunchy granola cluster is bursting with nutrient-rich chia seeds, whole rolled oats, wild blueberries or toasted nuts, and is naturally sweetened with a touch of golden honey and rich molasses. The clusters make for a nourishing breakfast or anytime snack that's sure to set your day on a course for true enlightenment. Enjoyed by the bowlful or the handful, with milk or yogurt, at the table or on the go; these granola clusters bring their chi-balancing prowess and body-fueling brilliance to wherever your path takes you. Chia Vitality Granola Clusters are perfect for kids of all ages; athletes and weekend warriors; corporate climbers and mountain climbers; as well as anyone who seeks to seed their soul. Each bountiful serving delivers 1500 mg of Omega-3s, as well as gluten-free whole grains, 10 grams of protein (soy-free and dairy-free), and 5 grams of fiber -- all baked into every magical nugget of joy. Why choose chia? Chia seeds are the richest plant-based source of Omega-3s on the planet. An excellent source of dietary fiber, complete protein and antioxidants, both the Maya and Aztecs held this ancient seed in high esteem for increasing vitality, strength, and overall good health. "Our new, organic Chia Vitality Granola Clusters are a crisp and crunchy way to enjoy all of the nutritional benefits of chia for breakfast or an anytime pick-me-up," said Janie Hoffman, Mamma Chia founder and chief executive officer, and author of Chia Vitality and The Chia Cookbook. "We're thrilled to answer our community's requests for more ways to enjoy the endless benefits of chia seeds throughout the day." 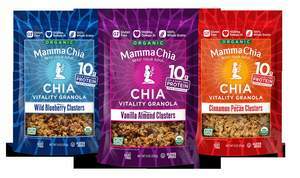 The announcement of the Chia Vitality Granola Clusters comes on the heels of the company's recent launch of the Mamma Chia Clean Energy beverage. This revolutionary clean energy drink combines the powerful nutrients of chia with the pure, clean energy of guayusa and refreshing organic fruit juices. The result is a truly healthy and delicious beverage that delivers 2500 mg of Omega-3s, 90 mg of natural caffeine (about as much in an 8 oz. cup of coffee), twice the antioxidants of a cup of green tea, along with fiber and protein, making it a super-healthy way to start the day as well as the perfect afternoon pick-me-up! Mamma Chia's new Chia Vitality Granola Clusters will be available January 2015 online at www.ShopMammaChia.com and select retailers, including Target. Mamma Chia is a conscious and sustainable company with a mission to share the magic of chia through delicious, high-quality, organic chia-based foods and beverages. Founded in 2009, Mamma Chia is a category innovator and maker of the first-to-market chia beverage, as well as the Chia Squeeze Vitality Snack. Mamma Chia was created by founder and chief executive officer, Janie Hoffman, in the kitchen of her small rural farm outside of San Diego. Selected as a 2014 Breakout Brand by Beverage World and named 2013 Best Retail Brand by Nutritional Outlook, Mamma Chia is a Certified B Corporation, a member of 1% for the Planet and a founding member of the Slow Money Alliance. Mamma Chia donates one percent of sales to support farmers, community groups and organizations that build healthy local food systems. Mamma Chia is available in mainstream grocery stores and natural food markets in the United States, Canada and other countries full of chia lovers. For more information, visit www.MammaChia.com.